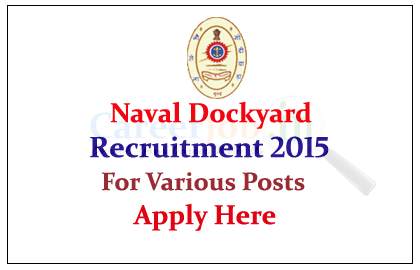 Naval Dockyard, Mumbai is recruiting for the various posts for the year of 2015. 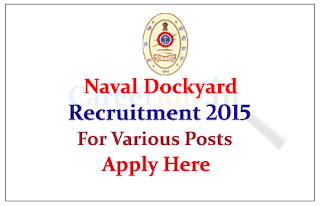 Eligible candidate can apply here online on or before 20th May 2015. The Yard was established in 1735 by the East India Company, which brought in shipwrights from their base at Surat in order to construct vessels using Malabar teak. One of their number, Lovji Nusserwanjee Wadia was (along with several generations of his descendants) a key figure in the success of the Yard, as indicated in The New Cambridge History of India: Science, Technology and Medicine in Colonial India. Eligible Candidates can apply online on or before 20.05.2015, for more details check official notification. Starting Date for Submission ofOnline Application: 11.05.2015 at 0900 hrs. Last Date for Submission of Online Application: 20.05.2015 by 1700 hrs. Last Date for Print out of Applications: 25.05.2015 by 1700 hrs.